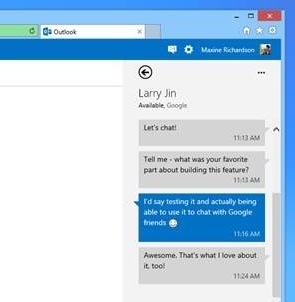 Microsoft is continuing its efforts to develop Outlook.com into a stronger rival to Gmail and other mass-market email services after it announced the addition of IM/chat support for Google Talk. The company is using the service’s public API to add the new feature, rather than any special relationship, but, nonetheless, Microsoft will hope that adding the massively popular services gives Outlook.com — which has 400 million active accounts — an edge over its rivals, and Gmail in particular. Microsoft says that the move is a response to feedback from its users who “choose to use many different services”, so the company is fulfilling its role “to help them connect to the people who matter most, wherever they are”. 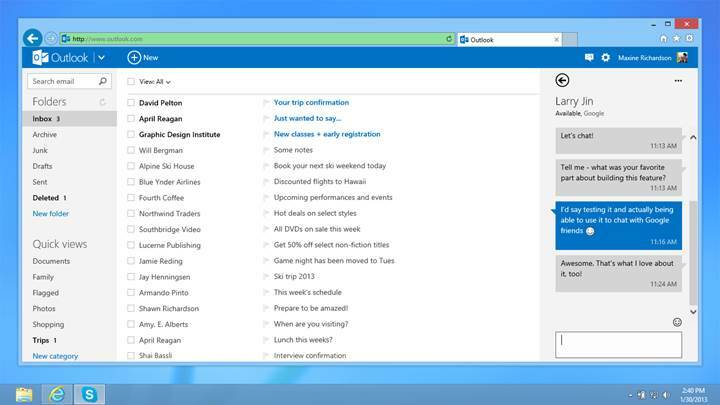 The integration has also come to SkyDrive and it follows the the rollout of Skype for Outlook.com last month. Google Talk joins a roster of other integrated social networks, including Facebook, Twitter, YouTube and LinkedIn. Thus, adding Google Talk — the only of these social services that Gmail supports — takes it past the Google email service, and puts a selection of the Web’s most popular services in users’ inboxes. Outlook.com had 400 million active accounts, as of May 2 when the company completed the migration of its Hotmail. Prior to that, Outlook.com hit 60 million sign-ups in February, six months after it was launched. While the move is an interesting one that brings more functionality and will make the prospect of an Outlook.com account more appealing to many, Microsoft is competing against bigger issues than just IM/chat functionality. Gmail is tightly linked to Google Drive and Google Docs, not to mention its vast array of other services, which has given it relative entrenchment on the Web today. Nonetheless, Microsoft is at least working to develop its service with useful and relevant new features. It will be interesting to see what else it has in store further down the line.